When generation is done, it will ask you to upload the public key to the host. Let it upload to ‘.ssh ‘ as destination folder. It assumes that the host has the appropriate SSH server for this client (the company has SSH server too) but since standard Linux servers use OpenSSH as SSH server, uploading the public key to the host is not enough and needs some modifications that follows. Now, you will be able to connect to the host, using this public key. Providing VPN access to vCD customers is a great idea, because usually customers are behind a vCloud created firewall and most likely you created a routed organization VDC network to connect them to external network. So, how they have to get access to their VDC? One approach could be to define different sets of firewall and NAT rules for required access ports (SSH, RDP, …) but when the number of VM’s grow, this would be less flexible but of course still doable. Even a customer can get access to only one VM and go through this single VM to access the others; however sometimes it’s not a simple remote access and remote user wants to do a more advanced task. By the way, I don’t want to go into the details of benefits of having a VPN for remote clients but it seems like a very helpful facility for cloud customers. We can leave it to the user to install its own VPN server to tunnel through to get access to organization VDC network but VMware provides this excellent capability to setup VPN gateways in vCloud Director or vSphere Cluster. For a Site-to-Site IPsec VPN, VMware vCD is pretty much straight forward. So, if you have a VPN gateway in place, easily you can establish a tunnel between your local network and your organization network in the cloud. I found this guide about setting up an IPSec tunnel in vCloud Director with useful examples, one with a Cisco WAN router. Here is another guide for a Cisco PIX and vCD; although the vCD version is old (1.5) but it’s too similar in terms of VPN tunnelling. 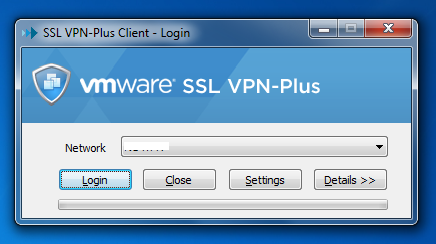 However, if you don’t have a VPN endpoint in-place and still want to establish a secure VPN-connection with your vCD organization network as a remote user, VMware provides this brilliant SSL VPN utility. It’s not as straight forward as IPsec VPN and it’s not present in vCD web portal but it worths deploying (especially for customers). VMware SSL VPN should be configured in vCloud Networking and Security solution (which is a new name for vShield Manager). 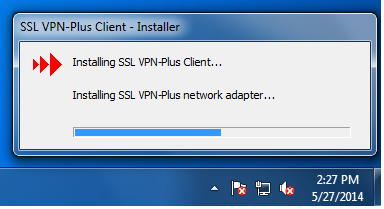 After getting the file, user can easily install the VPN client and that’s it. Running the application and entering the right credentials, VPN connection will be established and given that the configurations are server side are well defined, remote user will get access to VDC organization network in the cloud. In fact, what excites me is that from engineering point of view, VMware did a great job to ease the whole procedure of setup a connection on both server and client side; in specific, generating a custom designed VPN client using SSL (as authentication and encryption protocol) VPN is a brilliant idea. As a network or cloud administrator in VMware environment, we would like to have the same capabilities we’ve got in a physical network. One of the most important tasks is network traffic monitoring and inspection control. Let’s say you want to install a network Intrusion Detection System (like SNORT) to monitor the traffic of a specific Virtual Data Center in vCloud environment that is translated to monitoring a specific VLAN or port group in VMware vSphere. Fortunately, VMware 5.x provides these features but apparently implementing these features is beyond VMware vCloud Director operations and it’s part of infrastructure administration tasks introduced in vSphere 5.x. Since normally there is a port group in Distributed Virtual Switch defined by vCloud Director for each virtual data center, let’s talk about port groups in VDS. You may have noticed that when you want to create a port group in a distributed switch, you can define some security policy and one of the policies is enabling ‘Promiscuous Mode’. This is exactly equivalent to enabling promiscuous mode in a physical switch. So, as shown in the following picture, a port group can be edited to enable this mode (in vSphere Web client). The only concern is that promiscuous mode should be defined on a port group or the whole distributed switch and not on a particular port. Doing this will cause all the traffic to be forwarded to all of the VM’s in that port group! and apparently it’s a security risk because we would like to forward the traffic to only one specific VM (port) which is our IDS. A work-around here would be to define a new port group with the same VLAN ID of the port group/VLAN we would like to monitor with the exact same configuration, then enable promiscuous mode for this newly defined port group and place the IDS VM in this port group. Because VLAN ID is the same, only IDS VM would see all the traffic. That’s an easy trick! BUT I don’t know how this trick works in some vCloud port groups that use VCDNI-backed port groups instead of VLAN-backed network pools because as I understood, VCDNI is kind of encapsulation introduced by vCloud Director and I’m not sure if a port group that is created inside vCenter can decapsulate packets. I didn’t find enough information, so I will test this out and report it in this blog. Another approach is to use Port Mirroring feature of a VDS. Using this method it’s possible to specify source ports which need to be monitored and destination port/ports where IDS is located. Since VMware vCenter uses ports 80, 443 to provide access to management console (for both vSphere Client and Web Console), it’s important to secure these ports. Having said that, it can be limiting access to specific IP addresses in your internal network. If there is no firewall between your internal network and Cloud infrastructure, at least configure Firewall in Windows machine (if vCenter is installed on Windows) to restrict access. Also, for a complete list of tasks to harden vCenter Security, you can see Security Advisories, Guides document from VMware.